Jules and her father are barely scraping by and they still owe so much more currency to the debt collector. In their world, time is currency and it can be earned or extracted from your blood which then shortens your lifespan. 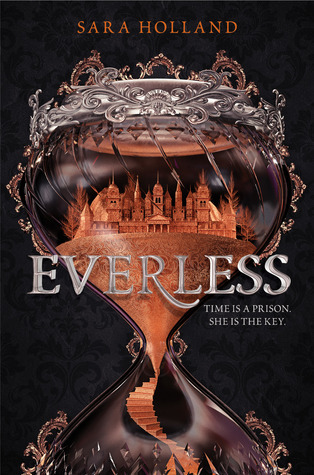 Jules is seeing signs that her father has been giving too much of his time away and might be close to death so when the opportunity to work at Everless, the nearby castle, arrives, Jules decides to go. She doesn't tell her father because he has forbidden her to ever return to the place they had to flee when she was young. Jules remembers playing with the two princes and an "accident" with fire that nearly killed one of them but they need to money so she goes anyway. After a last, dire warning from her father to never be in the same room as the queen, Jules knows there is more happening than she has been told and decides that the only way to get answers is to do exactly that. She takes a position as handmaiden to the queen's adopted daughter who will soon marry Jules' childhood playmate, hoping to find some answers about her own birth and family. I am super saturated with fantasy and dystopias (not that this was a dystopia because everything was pretty bleak) and generally are not overly impressed with most of them anymore, but I enjoyed this. You were thrust right into the world without a bunch of explanation but Holland did a good job revealing the rules of the world at a good pace that kept me from being frustrated about what, exactly, was happening here. I guessed a couple of plot twists but was pleasantly surprised that I was wrong about a couple more so the predictability/formula factor was low for me. Jules is a strong character and I liked that she was not overly conflicted in ways that led to her just being unlikable all the time which seems to be the go-to "character development" formula for many books and movies and TV shows now. She stands by her female friends and is helped by an older woman so the girl power aspect is strong in this one. In fact, the boys don't factor in much, at least not in terms of romance (beyond a crush) and that was also a refreshing change of pace. Even my teens are sick of the requisite romance in every book. They just want to action. I think this will be a winner for them.